A centerpiece for the ages, the Amish Beaumont Mission Trestle Dining Table takes center stage with brilliance. This handcrafted dining table speaks to quality woodworking with a thick table top and trestle base. No table legs means more comfort and less banging your shin on table legs. 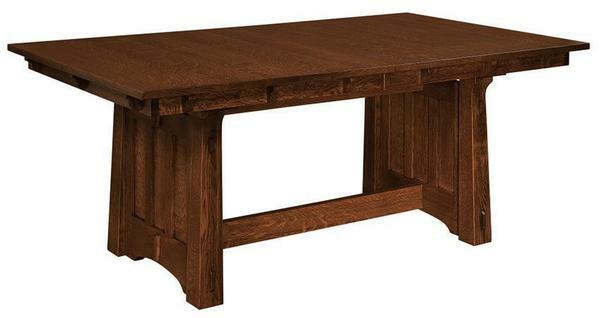 This trestle dining table is completely customizable, with numerous options to choose from. If there's one thing we love about Amish furniture, it's the choices that come with it to create your dream furniture! Ordering custom furniture is easy with DutchCrafters. If you prefer to work with a Furniture Specialist, give us a call or send an email today and we'd be happy to help. Thank you for shopping with DutchCrafters. Height from floor to bottom of skirting: 26.5"
42x66 and 42x72 tables can self-store 4 leaves, 2 with skirts and 2 without. Please specify self-store.